It's not every day you get invited to a polar bear Christmas party, so when a media release popped into my inbox, the kids and I wasted no time in hot-footing it to the Gold Coast. And so we made it to Sea World on the Gold Coast in plenty of time to join Queensland's version of The Polar Bear Express. 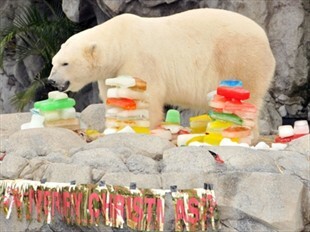 Yes, a team of about seven handlers had spent several weeks sourcing and wrapping and freezing and flavouring presents for Sea World's resident polar bears. And you thought wrapping kids' presents was tough! 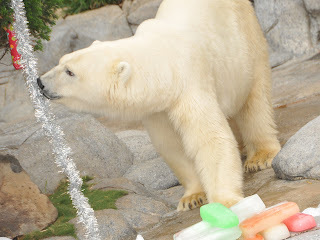 To help mimic behaviour in the wild, and to bring out instinctive behaviours, the staff had frozen treats like toys and dried fruit in blocks of ice, so the bears would have to work for their special gifts. Some blocks of ice were covered and flavoured - scents like vanilla and curry are apparently particularly enjoyed by the bears. Other treats and toys had been wrapped in traditional style presents and boxes. The handlers explained that unlike most animals, polar bears instinctively know what they can and cannot eat, so will not devour cardboard, paper, tinsel or any other product except food, drink and ice. And so we saw them sniff, paw, and tear their way through the wrappings in order to reach their gifts. Aren't they clever? Sea World is closed on Christmas Day, so the beary merry Christmas was brought forward for visitors could join in the fun. On the day itself, various staff will visit and interact with the bears, and treat them to a special Christmas dinner - a 20 kg tuna each! are ambassadors for their species and play a vital role in rasing awareness of the effects of global warning. Research indicates that Polar Bear numbers in the wild are declining, with between 20,000 - 22,000 bears remaining world wide. 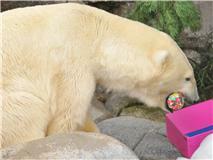 For the new year, staff have fingers and toes crossed that 2011 may bring the pitter patter of tiny polar bear paws. Technically, the boys, Hudson and Nelson are ready, but as far as staff know, they haven't acted on any mating instincts. Liya is apparently particularly fond of Nelson, so who knows what a year could bring? Readers, what are you hoping for this Christmas? Hmm, I wonder what this is? "Ooh, this one looks interesting!" "This tinsel is nothing to sniff at! Where's the food?" "Oh wow, clearly I was a very good bear this year..."
Sounds like the polar bears really had fun. Felix our cat loves your pics he cant take his eyes of them, think cause they are white like him. to loоk a nice blog like this one nοwаdays. Usually I don't learn article on blogs, however I would like to say that this write-up very compelled me to check out and do it! Your writing style has been amazed me. Thank you, very great article.